On a frigid Saturday night in February, a typical evening out on the town might include dinner, maybe a movie, or a stop by a club or bar. 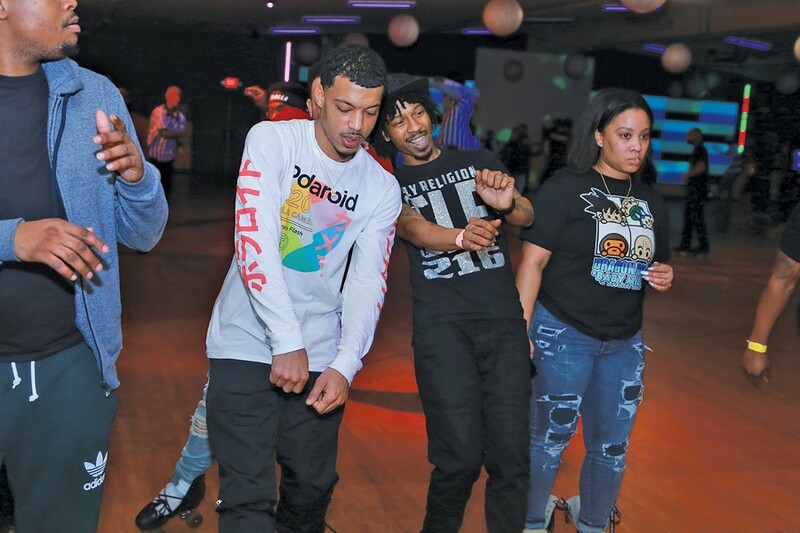 Here, though, at Mig's Pla-Mor in Euclid, hundreds have gathered for a late-night adult skate organized by SI Currency, a local promotion and events company headed by Chrishaw Clarke. It's the fifth such night SI Currency has put on and has already been welcomed and celebrated for continuing to keep black roller skating culture alive in a city that has a proud, long and troubled history in that area. "We did one in 2017, just to try it out," Clarke says. "People loved it so much, but then Pla-Mor closed. My guy Miguel [Sanders] opened it back up, and the feedback that I got, and that fact that it was something fun and different, made me want to keep doing it." Talk to local skaters and they'll talk about the freedom of skating, the style and art, the sense of community and tradition, the intergenerational ties. Those are all driving forces behind tonight's turnout, and they're also in line with the sentiments given national focus this month with the release of the documentary United Skates on HBO. Produced by Tina Brown and Dyana Winkler, with John Legend as executive producer, the film examines the rich and complicated layers of black skating culture in America, from segregation that drove black skaters away from white rinks to the resultant underground that became instrumental to '80s hip-hop, from the popularity and intense community connections of black roller rinks to the accelerated disappearance of those rinks across the country. That term — adult night — has come to be known as a coded way of saying Black Night. It's the term that stuck around after a previous roster of labels — R&B Night, Urban Night, Soul Night, Soul Skate — largely came and went, all of which were used by rinks and promoters as a way to integrate white skating rinks but only on specific nights. Now, however, it's a way to keep a tradition alive. Mig's Pla-Mor is actually the third iteration of the Pla-Mor, whose origins date back to 1942 when a man named Elmer "Al" Collins opened the original Pla-Mor Roller Rink on Cedar Avenue and East 107th. There, at the city's only black-owned rink, Collins hosted roller skate vanities, offered lessons, trained students, organized teams to compete in official competitions, and generally strove to use skating to better his community and his neighbors. Besides being black-owned, the Pla-Mor was also the only Cleveland rink for years where black people could skate during de facto segregation. "They didn't put up signs for blacks and whites, you just knew," a man named Russell J. Toppin Sr. told Cleveland Historical in an interview. "You just knew black folks didn't go to Skateland and white folks didn't come to Pla-Mor. I didn't think it was a good thing, but at the same time it was the status quo." 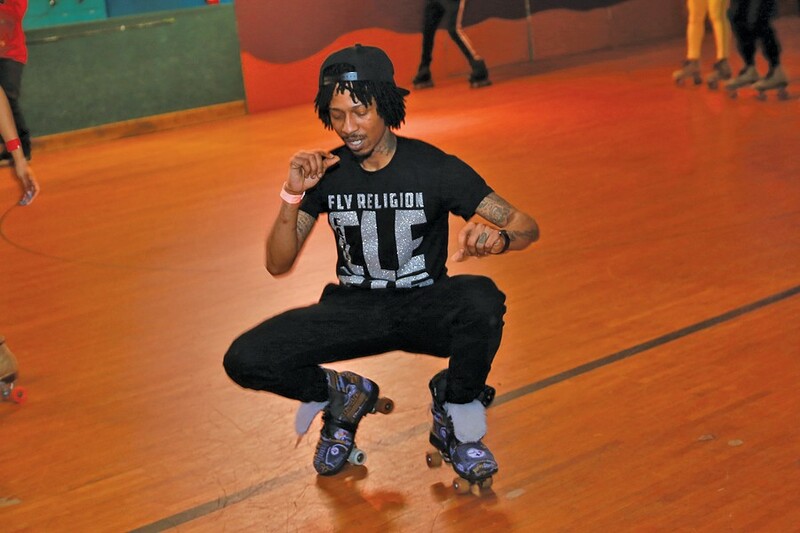 Skateland, on Euclid Avene and East 90th, and other rinks routinely and openly discriminated against black skaters, using any and every excuse to get them out the door: "Your wheels are too small and will scuff the floor." "You need to be part of a church or recreation group to skate here." As demographics on the east side changed in the 1950s and racial tensions simmered in the 1960s, the Pla-Mor was a refuge for the black community. "It was Thursday nights we'd go to the Pla-Mor," a woman named Eleanor Cannady said in a Cleveland Historical interview. "There was organ music and it was a lot of fun. You'd get together and go as a group." Those racial tensions hit conflagration mode in 1966, and months after it had been remodeled and renamed the University Party Center — though everyone still called it by its original name — the Pla-Mor burned to the ground during the Hough Riots. Other rinks popped up over the years and decades — the Blue Goose, Seven Bells, Southgate in Maple Heights, Golden Gate in Mayfield Heights — but none laid claim to the kind of community that the Pla-Mor had, and the undercurrents of race were never far away as "soul skates" and related nights came into vogue. 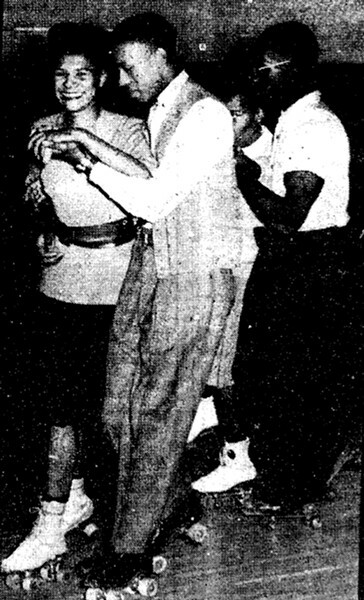 In 1988, for instance, United Skates in Wickliffe faced vociferous backlash from residents for hosting all-night skates geared toward blacks and was forced to suspend them for two months because neighbors complained the events attracted "inner-city teen-agers"
"These are kids that are from problem areas in Cleveland, and it's nothing for them to have baseball bats and crowbars in their car," one resident told the Plain Dealer. "When they've grown up in an area where there are lots of problems, they bring those problems with them." "It is (racially motivated)," United Skates managing partner Bruce Aster told the PD. 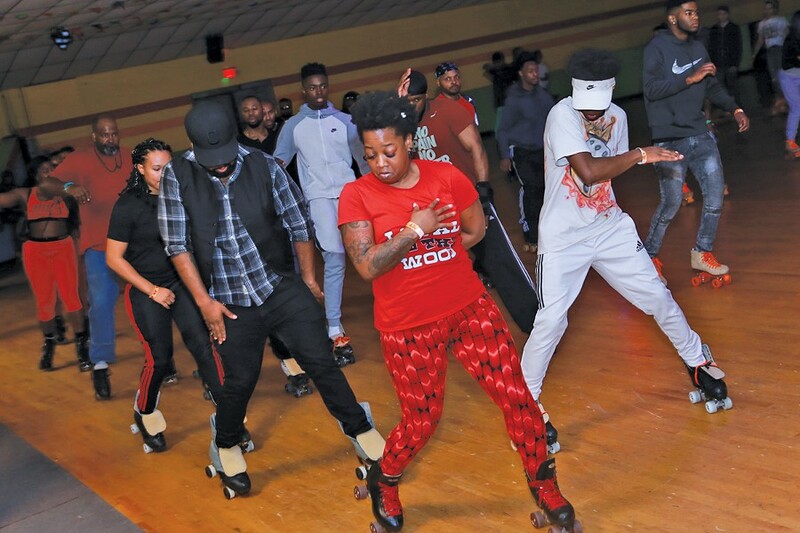 "[The Soul Skates] attract a predominantly black crowd from outside of Lake County because they feature black-oriented music and are advertised on WZAK, an urban contemporary station." Then-Wickliffe-mayor Robert Aufuldish preferred to pretend it was about something else. "We'd like to keep the racial overtones out of this," he told the paper. "I suppose they're there." As the United Skates documentary deftly illustrates, the segregation and racism behind adult nights and soul skates were painful; but it also gave birth to a rich culture with national influence — N.W.A., Dr. Dre, Queen Latifah, Naughty by Nature and Salt-N-Pepa all found inspiration and accommodation in skating rinks when they were ostracized by traditional venues. And while rinks continue to disappear thanks to development and rising rents, the culture is still very much alive. On that chilly February Saturday night, the bass from tunes being played by special guest DJ Ryan Wolf reverberate through the rink of Mig's Pla-Mor as skaters of all skill levels show off. Mig is Miguel Sanders, who reopened the place last year. It had previously been owned and operated by a group who snatched up the place after the Euclid Rollerdome closed in 2008 and rechristened it the Pla-Mor after the legendary venue most of them had enjoyed growing up. "The tradition of the Pla-Mor is what we're remembering," co-owner Cliff Murray told the Plain Dealer in 2009. "It's the only place blacks were allowed to skate at the time, up until 1964." Some up years, some down years, and no small mountain of financial and maintenance problems later, it closed in January 2018 before Sanders came calling. A lifelong skater himself and former director of the Upward Bound Program at Case Western Reserve University, Sanders knows that attaining success won't be easy and that times have changed, but that doesn't mean he won't put up a fight. "We haven't been open long, but it's a challenge," Sanders says. "It's a lot of work, but at the same time it's doing something that I love so it's rewarding." Even with the biggest of emotional attachments to local skating rinks, the bottom line remains that they need support from the community to thrive. The rinks often tinker with their prices, straddling the line between being affordable and trying to turn a profit. As the owner of the now-closed Rich City in Chicago says in the documentary, "It takes a lot of $5 to fill up this rink." Patrons and friends who've shuffled between rinks in Northeast Ohio are probably familiar with the routine financial pressures that owners face. Sanders also understands that it can be difficult to reach a generation who literally has the world in the palm of its hand, but he also believes that skating is on its way to being hip once again. "I think that because young people have so many options like video games, cell phones and computers, there's not such a big emphasis on skating like there used to be," he says. "At the same time, I think that it's trendy. I think it's coming back around. People are able to find skill in it." Unique regional trends and styles have emerged and evolved over the years. In Chicago, the style is called JB, as they mostly skate to music by James Brown. In New York and New Jersey, skaters link their arms together in trains. In Philadelphia, the style is called Fast Backwards. In Kentucky, skaters often pull each other in between their legs. In Detroit, there's a smooth rolling motion that can be traced directly back to the Motown sound. In Cleveland, the two predominant styles are known as Shuffling and Freestyle. With shuffling, skaters move with a smooth two-step with a bit of a bounce. Freestyling is when skaters jump up into the air and do 360-degree (and sometimes 720-degree) spins before landing. One skater described it as "hittin' moves." As there are many styles, there are many crews. Take a quick glance at the patrons at any skate night and you're bound to see a number of these crews represented. They wear shirts that bear names such as Elite Squad and Midwest Skaters Community. One group formed through their love of Marvel comics and dubbed themselves The Avengers of Cleveland. Group member Stephen Phillips, aka Blaq Panther, recalls how an ex-girlfriend and a buddy first got him into skating. "I was just inside doing my own projects and some music here and there," Phillips says. "My girlfriend at the time said I needed to find something to do. I had a friend and talked to him about it. He told me skating was a great way to get active and I fell in love with it from the first time I came out." Fellow Avenger Kristen Bradford wondered where her friend was going during the week and found herself falling in love with the world of skating soon thereafter. "So he started skating and I'm trying to figure out where he's at when it's 11 o'clock on a Tuesday," Bradford says. "Then I started coming and you fall in love with it. You always want to learn more. You see something you want to do. It's a certain vibe here." Altogether there are about 10 members in the crew. The current roster also includes Deadpool (Brian Atlas) and Captain America (Eric Tate), who both sit at a table eager to share their experiences, as well as Gamora, Scarlet Witch, War Machine, Rogue, Dark Phoenix, Wasp and Quicksilver. Leylani Wilson of the TrendSettas crew has been skating since she was 5 years old. The crew originated in Cleveland, but when one of the founders moved to Columbus, a chapter was started there. She says the group now has members as far away as London and has been active for 12 years. "You don't want to skate in rentals because you can't really get the feel of how you skate," she says. "So you get skates, that's the beginning of it. Once you get skates, then you want to start coming every week. Once you come every week, then you'll want to start traveling. It's an amazing thing." The following evening, snow showers that would have derailed plans for the vast majority of Clevelanders are seen as only a minor inconvenience for the skaters at United Skates Wickliffe's adult night. The DJ for the evening's session sits in a booth above the rink watching people shuffle in groups that seem to multiply with each turn. Occasionally, skaters jump up and hit that freestyle perfectly in time with the music. In the center of the rink, many skaters opt to dance in place on their wheels until they get the notion (or opening) to begin rolling once again. The crowd has a greater mixture of ages, with some beginners pensively taking to the floor and some veterans who have been hitting the wood for years. One of those revered veterans is Joel Smith. Everyone calls him Smitty, and he has an undeniable coolness about him. His thin gold chain drapes onto a shirt embroidered with the Cadillac logo. A fellow skater describes him as the Michael Jordan of the Cleveland skate world. He began skating when he was 5 years old and will be 53 this year. "This here is a whole new regime," Smith says of the flood of new skaters. "You can see all the people with rental skates and it changes every couple of years. You have people that really want to skate and then you have people that just want to kick it and then you don't see them anymore." With that said, Smith does have love for the younger generations and does feel a connection with them. "We're a big community," Smith insists. "We've got so much skate love in here. All these people love to skate. They are wear the same T-shirts, they just started that within the past 10 or 15 years with people having their own clubs and everything. I like to see the younger guys because they have a lot of different styles. It's really a melting pot now because of all the places we go." For newcomers, the typical adult night can be a scary place. T. Shelby Clay decided to put together a crew to combat some of those fears. "I saw a lot of people who were watching me doing steps in the middle, like line dancing," Clay says. "A lot of people flocked to me on that, so I put them all together. None of them knew each other and in my mind I was giving them the gift of each other so they can feed off of each other's growth and have that confidence and safe space in what can be a crazy environment." The Sk8Life crew has been together since November, and Clay, the son of a former skating rink manager, says that none of the other members have been skating for more than two years. He, on the other hand, has been skating for 23. Ultimately, his goal is for each member of his crew to go off and do the same thing for another group as he did for them. It brings him a sense of peace. "I took them to their first state jam which was Icy Hot in Columbus," Clay continues. "They absolutely loved it. It's about showing them the positive aspects of the culture and teaching them how to deal with the negative aspects." That explicit and implicit focus on positivity dates back decades, to the earliest days of the original Pla-Mor and articles in the Call & Post vouching for skating's ability to get kids off the streets and away from danger. Oftentimes when there's an adult skate, the security concerns are heightened, but SI Currency's Chrishaw Clarke feels that it all boils down to having fun. "At the end of the day, there's no drama and no violence," Clarke says. "We're just skating." The TrendSetta's Leylani Wilson agrees. "It's one of those things where we use it as an outlet instead of being in the street," she says. "You have so many kids who don't have anything to do and are out there, but with this culture it's more like, "Naw, I want to go skating" instead. When you come to the rink, you want to be on your best behavior because if you mess up there, you can't come back." Miguel Sanders has a 25-year background in education, and like Elmer Collins did 80 years ago, he envisions the Pla-Mor as more than a rink. He's determined to launch additional programming that connects to the community on a larger level, using the art and freedom of a sport that has served as a safe space and escape for so many young black people. After all, skating is a beautiful, beautiful thing. "You know we go through our work week, day in and day out, and sometimes you just feel so heavy; but when you get out here on the skate floor and hear your jams, you're just free," Avengers' skater Christen Bradford says. "You can zone out and just go. You shut your brain down and your body moves and it's just free."